These Candy Crush level 52 cheats and tips to show you how to beat level 52 of Candy Crush. The goal of level 52 is to clear all 9 jelly and score 40,000 points in 50 moves. Level 52 Cheat #1: Horizontal striped candies are key. Horizontal Striped Candies are Key. Because of the three rows of obstacles on the bottom, activating a horizontal striped candy in one of them will clear a whole row of the chocolate, meringue, or licorice cages. One horizontal striped candy in the right place can almost win the level on its own. Vertical striped candies are also effective, because they can cause cascades, which can cause more damage and help clear the board as well. These Candy Crush Dreamworld level 52 cheats and tips to show you how to beat level 52 of Candy Crush. The goal of level 52 is to clear all the jelly in 26 moves and get at least 30,000 points..
Level 52 Cheat #1: Contain the chocolate blockers. The jelly you need to remove is underneath layers of chocolate and meringue. Blow a hole in the chocolate and work your way to the bottom, but remember that chocolate will grow if left unchecked. Concentrate on eliminating it early so you don’t have to deal with it later. Horizontal matches will help you destroy as many blockers as possible in one normal match. A vertical match can still help you tunnel down, especially if you use it to create striped candy (which could easily get rid of the chocolate problem). Level 52 Cheat #2: Use special candies well. Horizontally striped candy can destroy all of this level’s chocolate, meringue, or licorice in one move.If you make one, try to move it into a position where it’ll do the most damage before detonating it. 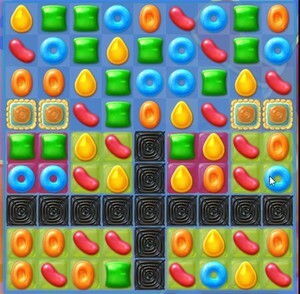 Mixing a striped candy and a bomb in the last two rows will handily destroy all the remaining blockers in the level, leaving you to clean up the jelly at your leisure.